Spent about SGD $17 per person. 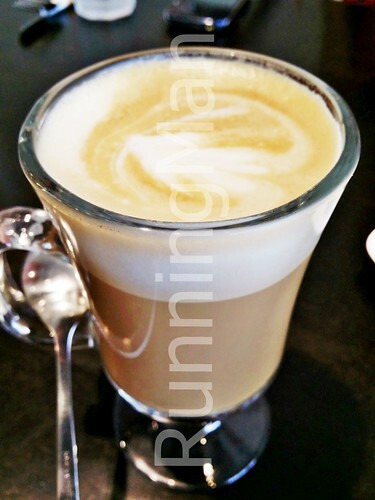 I find the Latte to be rather weak, coffee isn't a strong point for them. 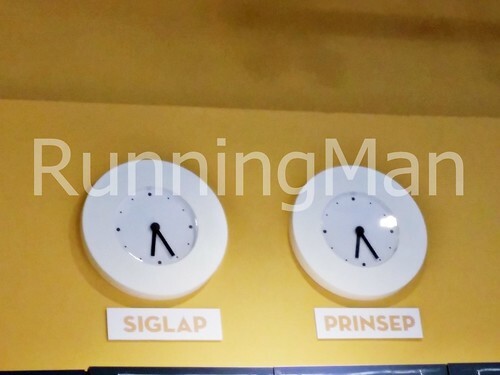 Skip this and get other drinks instead. 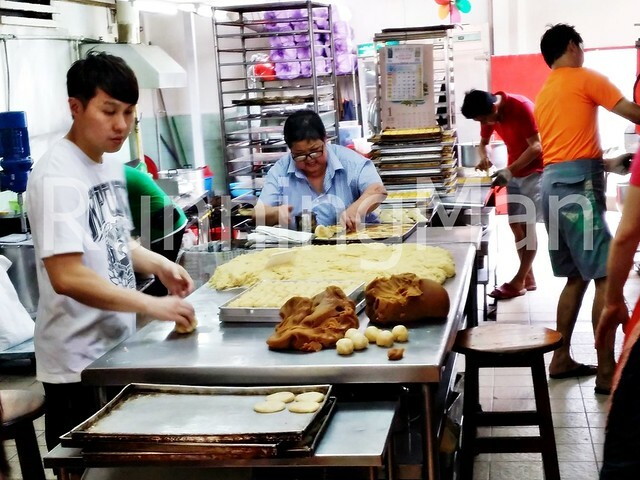 Since 1948, crowds have been flocking to Loong Fatt Eating House & Confectionery for only one thing, the traditional Teochew Chinese biscuit known as Tau Sar Piah, or Bean Paste Biscuit. 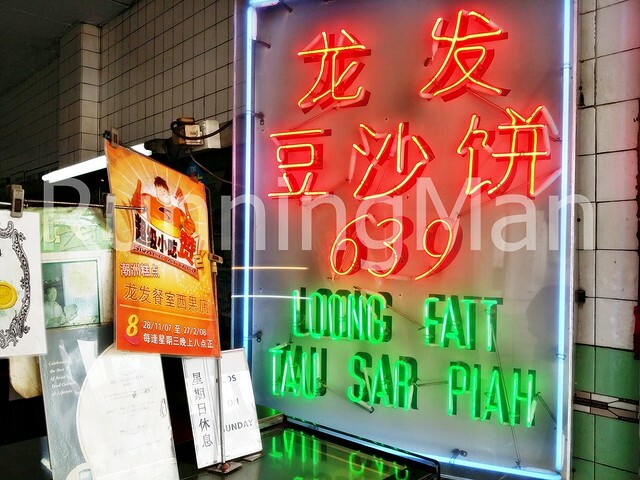 Handmade daily from scratch, and only available in 2 flavours, salty or sweet, Loong Fatt Eating House & Confectionery has become so famous that their location along Balestier Road has become synonymous with excellent Tau Sar Piah. 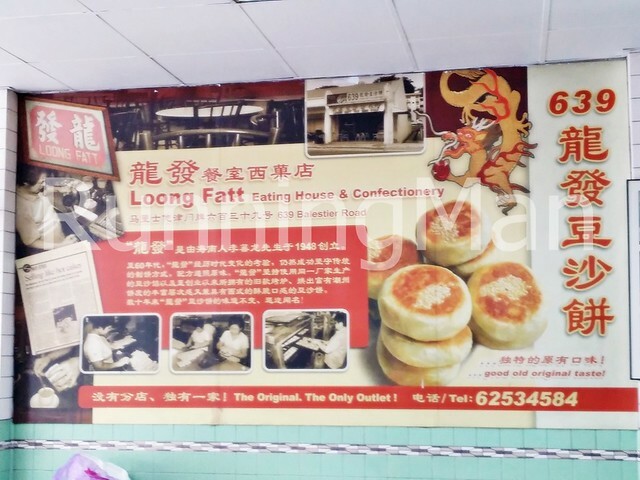 Stepping into Loong Fatt Eating House & Confectionery is almost like a trip back in time, as the coffeeshop looks almost like it did back in the 80s. 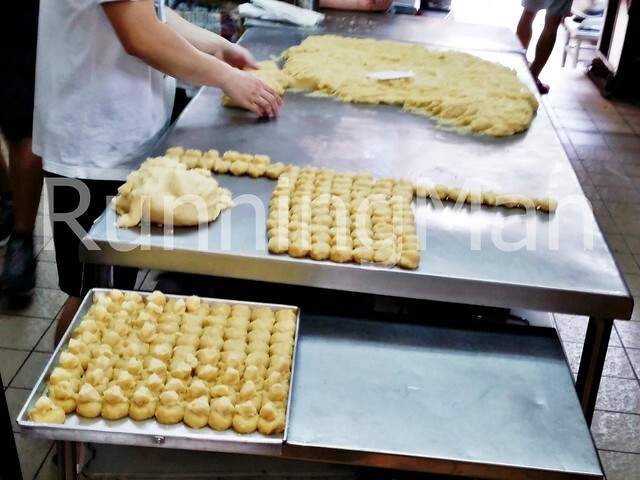 Modern ovens aside, the Tau Sar Piah / Bean Paste Biscuit are constantly hand made throughout the day, and part of the appeal is watching them make it as you queue. 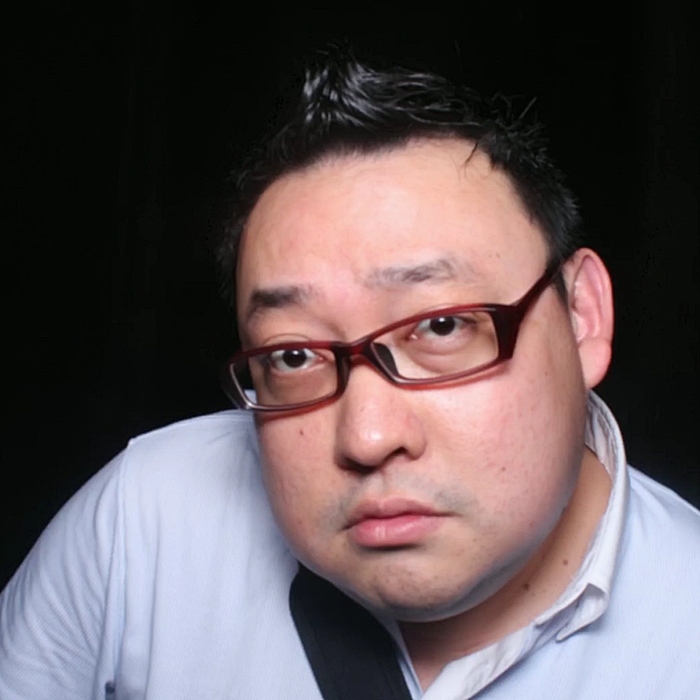 And yes, the average queue time is about 20 - 40 minutes. 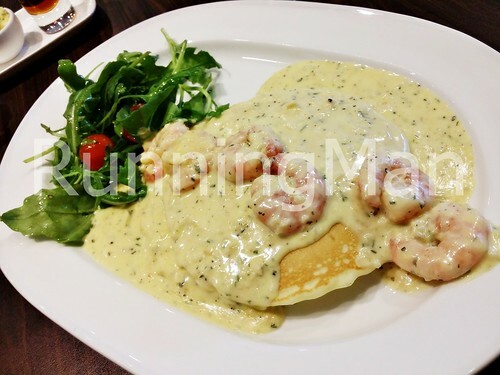 Don't expect a high level of service, as orders are placed at the counter, and the staff pack it for you. There is a trademark grumpy auntie who is constantly grumpy... Loong Fatt Eating House & Confectionery just wouldn't be the same without her! 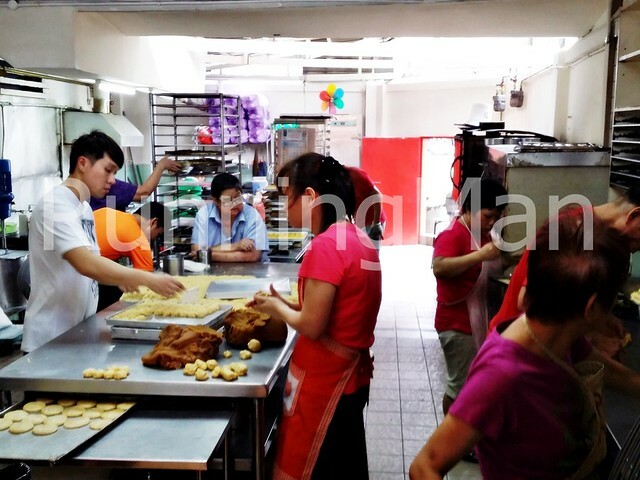 While Loong Fatt Eating House & Confectionery does sell other confectionery, the star is still their Tau Sar Piah. 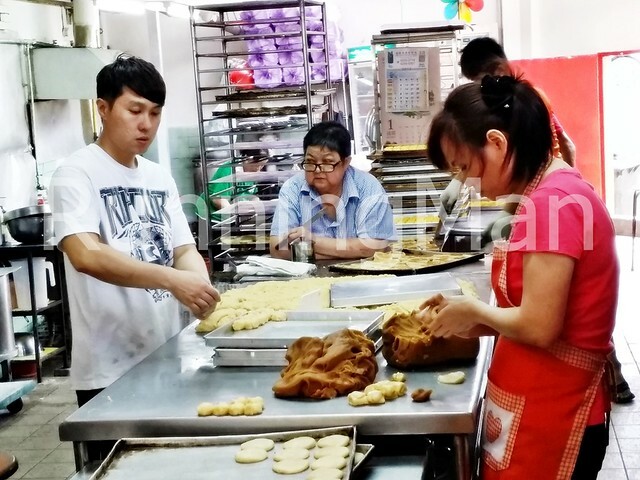 Prices have remained fairly cheap throughout the years, with each Tau Sar Piah / Bean Paste Biscuit costing a mere SGD $0.60. 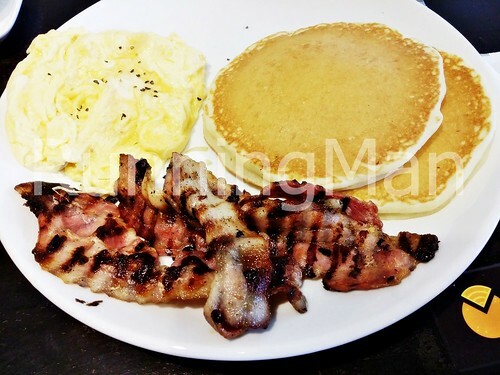 Loong Fatt Eating House & Confectionery opening hours are from 8am till 4.30pm, Mondays through Saturdays, and closed on Sundays. A good quality butter used in making the crust results in it being slightly oily, but crisp and savoury without being too flaky. 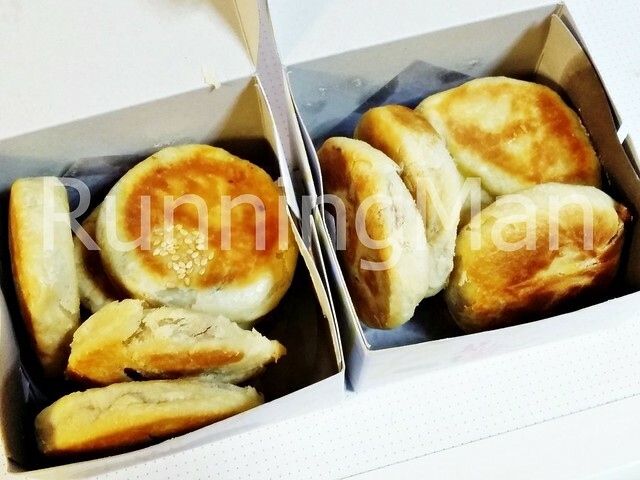 The sweet or salty bean paste filling is thick, generous, and non-crumbly. Best eaten when hot, but even after a few days of refrigeration, they still taste good, even if eaten cold or reheated, a sure sign of quality. 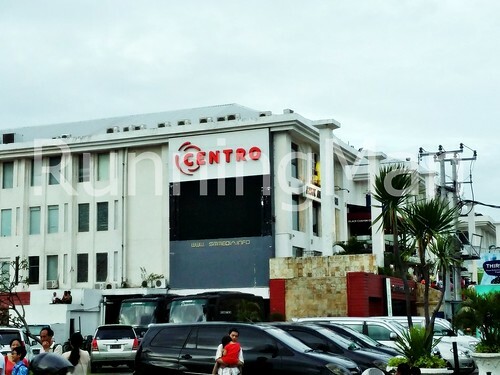 As the most populous city in the tourist destination of Bali in Indonesia, the city of Denpasar has grown rapidly through tourism, but is also the main business hub of the state. Denpasar hosts multiple attractions, and its cultural traditions and heritage sites are very well preserved because of tourism. 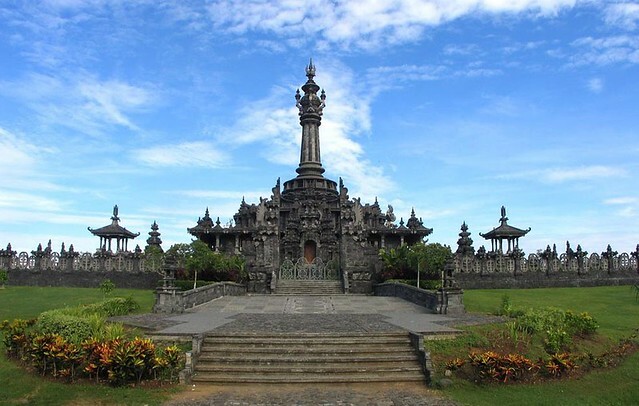 Here are the Top 5 Tourist Attractions to visit in Denpasar, all of which hold important cultural or historical significance. All these are permanent locations which can be visited and viewed at any time throughout the year. 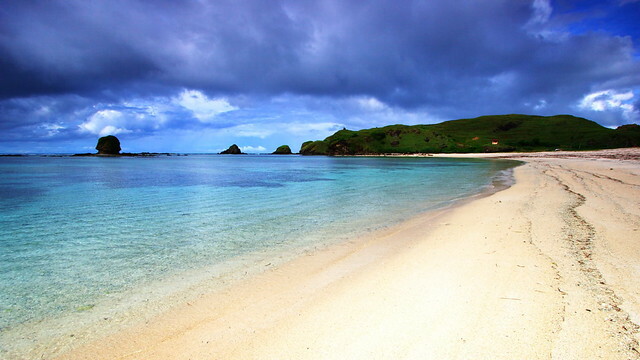 Bali is known worldwide for its long, sandy beaches, offering magnificent views of the ocean and skies. Kuta Beach is the most famous beach of them all, even across Indonesia, with its beautiful sunsets, and large waves suitable for surfing. 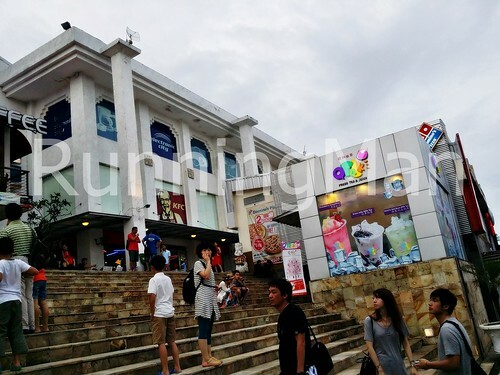 The Bali Bombing Memorial is near Kuta Beach, commerating the 2 infamous attacks in 2002 and 2005. 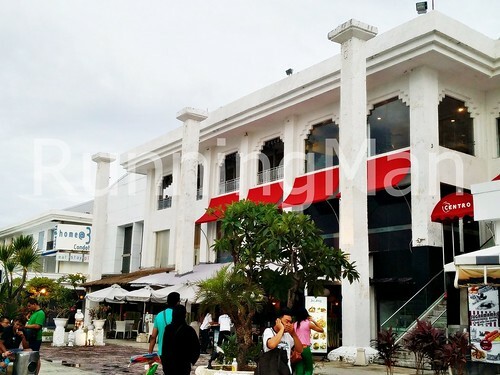 Along this stretch of Denpasar are numerous bars, restaurants, and shops selling all manner of handicrafts. 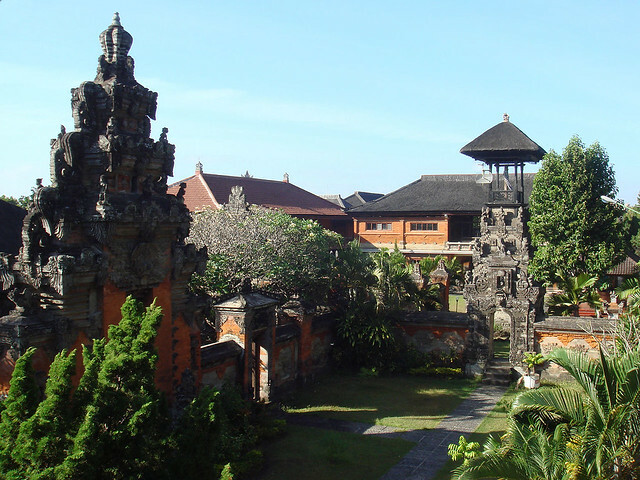 The Bali Provincial Public Museum, or Bali Museum, is the oldest musuem on the island, designed in Royal Balinese style, and divided into 4 areas exhibiting over 10,000 artifacts from across Denpasar and Indonesia. 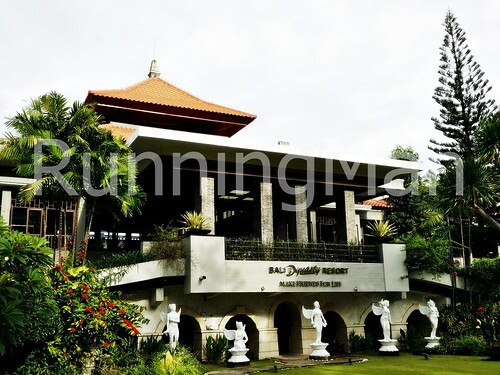 Mainly anchored around culture and history, the collection at the Bali Provincial Public Museum includes artwork, ancient inscriptions, statues, textiles, household items, agricultural tools, musical instruments, theatrical masks, weapons, ritual items, paintings and more. 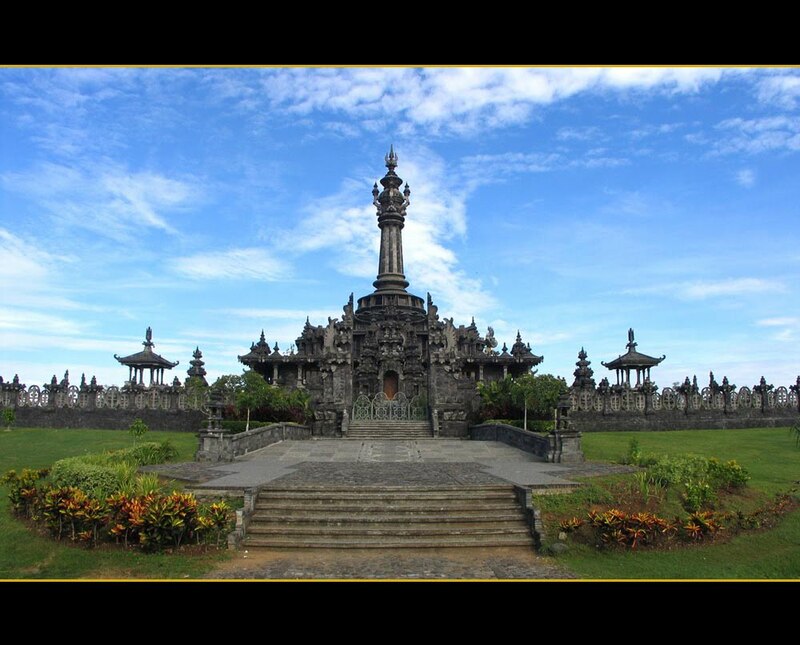 The Bajra Sandhi Monument commerates the soul and struggles of the people of Bali during the independence of Indonesia. It comprises and outer courtyard, inner courtyard, and a main building, all with carvings and sculptures. 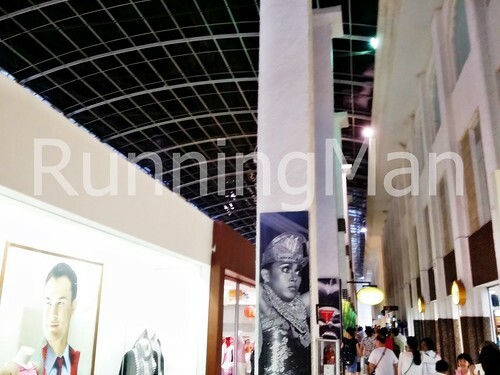 The main building of the Bajra Sandhi Monument has 3 levels, offering an exhibition room, small lake, 33 dioramas which trace the history of independence in Bali, and a tranquil viewing platform offering a panoramic view of Denpasar. 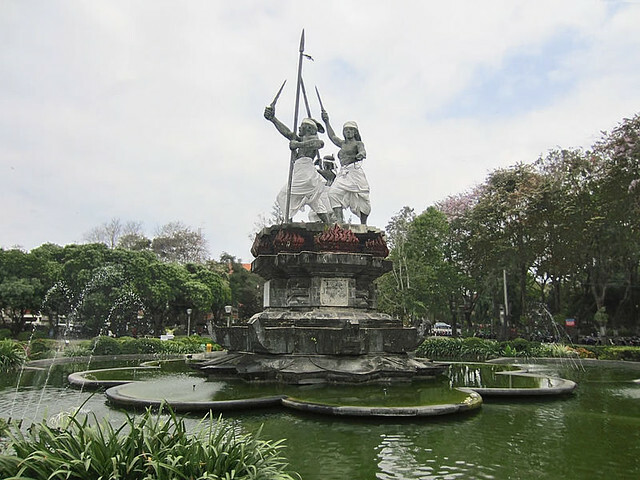 Puputan Badung Square is an urban park in Bali, dedicated to the heroic yet suicidal defense of Denpasar by the local Indonesia rulers against the Dutch invasion in 1906. A statue depicting a man, woman, and child brandishing homemade, yet inffective weapons against the dutch, including jewellery, as reports say the women flung jewellery at the invaders. 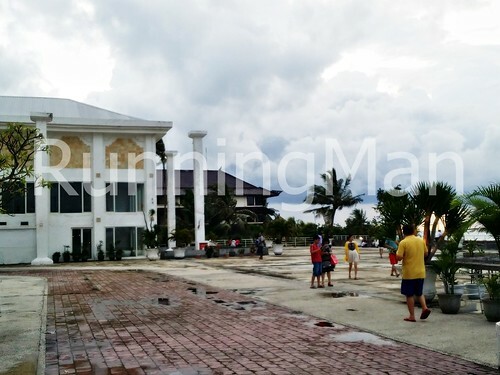 Puputan Badung Square is a popular place with locals for relaxation and sports, as well as a great place to catch the sunset. Tanah Lot Temple is located on the Tanah Lot rock formation, about 20 kilometres from Denpasar, just off the coast of the Indonesia island of Bali. 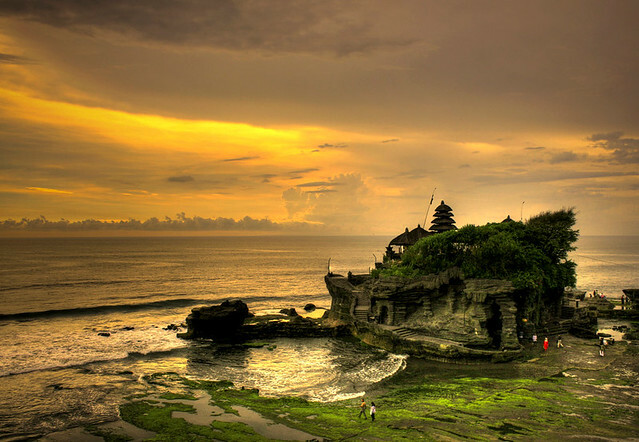 Tanah Lot Temple is a famous cultural pilgrimage temple, but is also known worldwide for its magnificent view of the setting sun, and multiple spots for scenic photography. 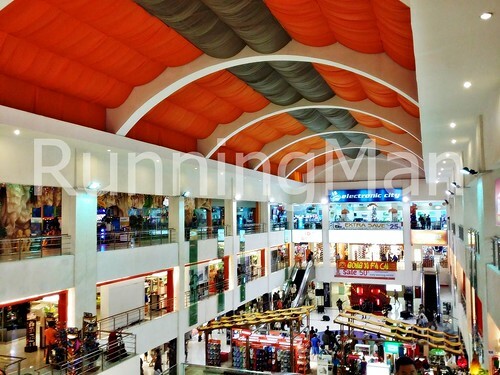 The area has become commerialised as a result, and there are a multitude of souvenior vendors and restaurants. 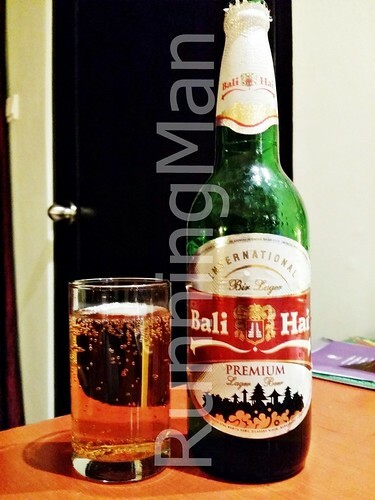 The most common drink here is the Es Kelapa Muda, or chilled young coconut. Despite being part of the overall cuisine of Indonesia, the cuisine of Bali / Balinese is rather distinct, being predominately influenced by India, China, and Australia. 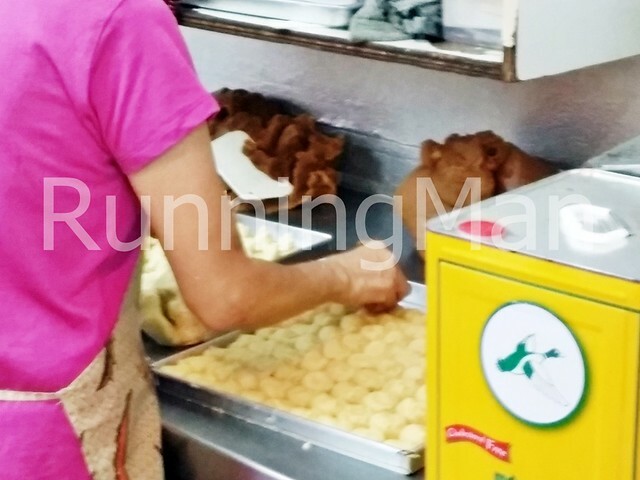 As such, Denpasar Street Food is a heady mix of international food, although some traditional indigenous food still holds out strongly. As Bali is a popular tourist destination in Indonesia, there tend to be many cooking schools in Denpasar, ensuring the traditional food of the island will continue to grow in popularity. Food in Denpasar can be found along the streets, in small cafes or kiosks, in mid-range restaurants and fine-dining establishments. Balinese cuisine is defined by the extensive use of fresh fish or seafood as ingredients, and beef is rarely consumed. 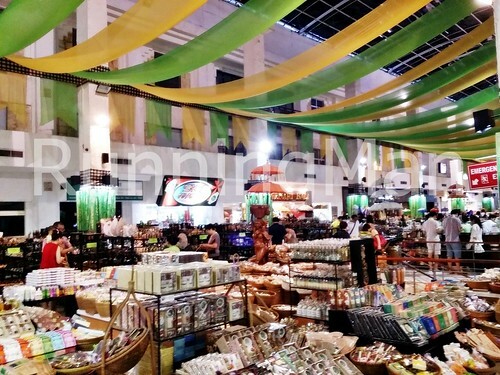 Common ingredients used in many Denpasar dishes include pork, chicken, fish, rice, soy beans, lettuce, bean sprouts, cucumber, tomatoes, squid, shrimp / prawns, peanuts, coconut, galangal, shallots, garlic, turmeric, ginger, kaffir lime leaves, coriander, cumin, clove, nutmeg, sesame seed, candlenut, pepper, palm sugar, banana, rambutan, mango, jackfruit, chili and more. 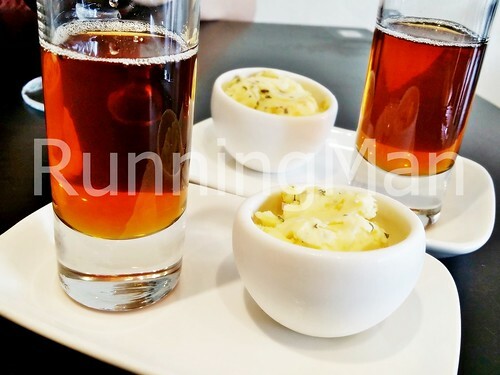 Basa Gede or Basa Rajang is a typical Balinese spice mix used in many Denpasar dishes, along with other traditional and popular spice mixtures like Basa Genep and the ever-present Bumbu. 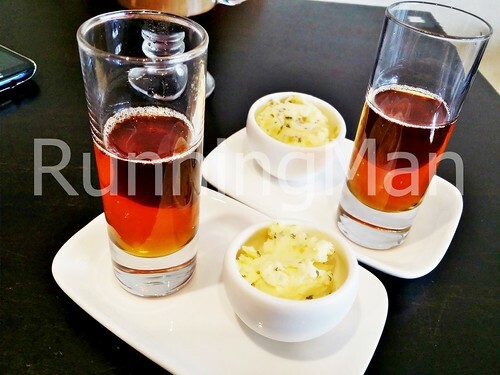 These 3 spice mixtures often form the base of many traditional Bali dishes in Denpasar. 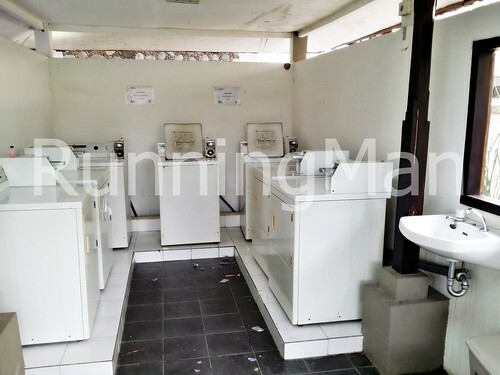 Because of Bali status as a tourist destination, many food outlets rarely open for breakfast, opting to open during the more lucrative lunch and dinner times, with many staying open till the wee hours of early morning. The iconic Bumbu spice paste of Bali is used to great effect in Daging Bumbu Bali, or Balinese Beef Stew. Cubes of beef, or sometimes pork, are slow cooked with garlic, shallots, coriander, kaffir lime leaves, salt, dried shrimp paste / belacan, candlenuts, ginger, galangal, bay leaves, water, tamarind pulp, sweet soy sauce and chili. 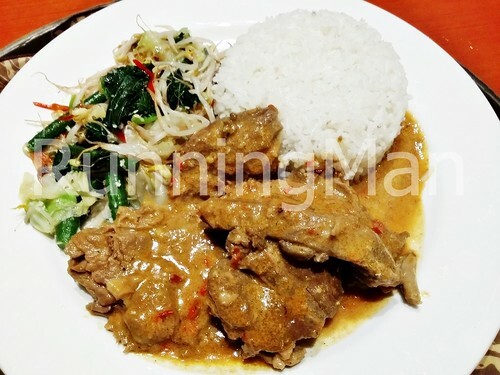 This results in tender, flavourful meat, which is typically served with white rice. Daging Bumbu Bali tastes even better if refrigerated overnight! 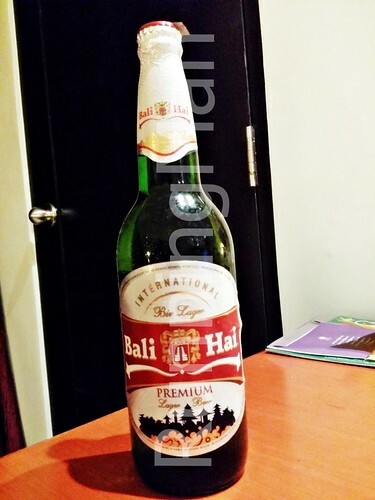 Named after a musical showtune, Beer Bali Hai is a light, refreshing brew with a golden colour and well-rounded body, perfect for the summery climate of this part of Indonesia. 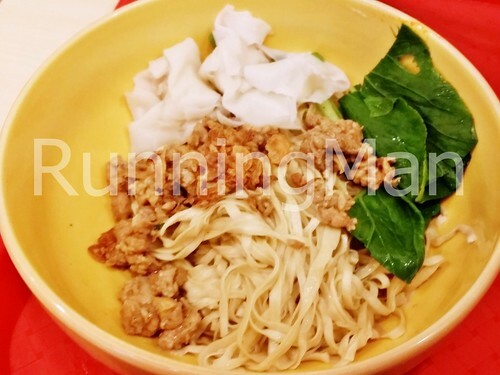 Mie Ayam Pangsit Rebus, or Indonesia Chicken Noodles, is a one-dish meal of yellow egg noodles, minced chicken cooked in spices, chicken dumplings and kai-lan / chinese broccoli. Seasoning spices used include vegetable oil, shallots, garlic, ginger, salt, pepper, coriander, soy sauce, chicken stock, water and sesame oil. 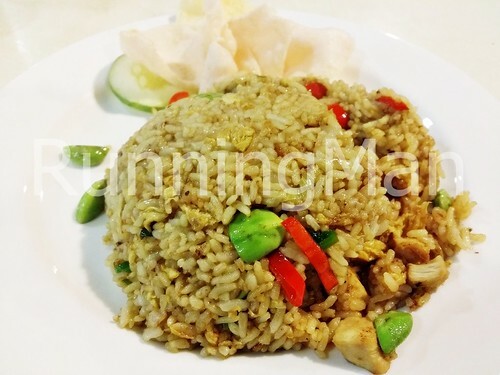 A favourite of Denpasar locals, the Nasi Goreng Pete is essentially fried rice with petai beans, also known as stink beans for their peculiar smell. 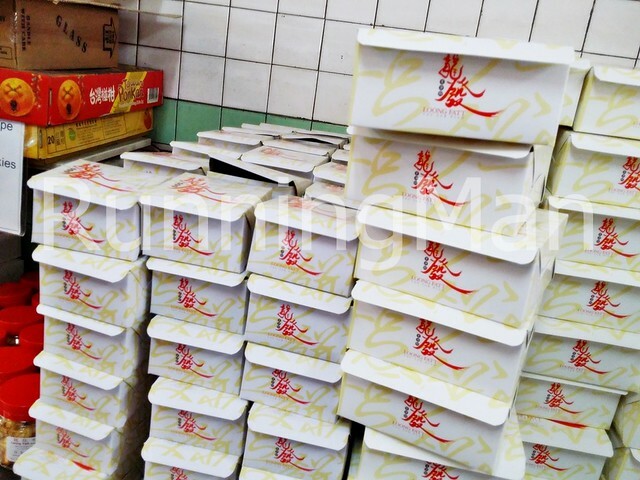 Beyond this main ingredients, a variety of other items can be added, such as eggs, diced chicken cubes, spring onions, chili, onions, salt, sweet soy sauce and shrimp / prawns. 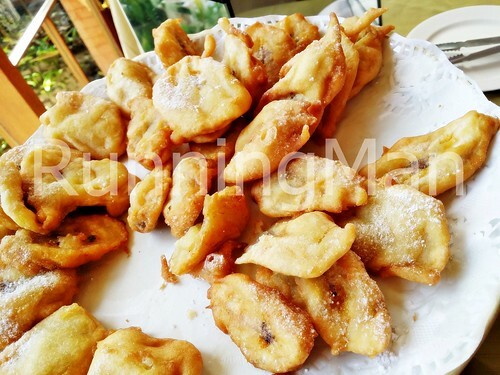 Pisang Goreng Godoh Gedang, also known as Fried Banana Fritters, are a popular Balinese snack. 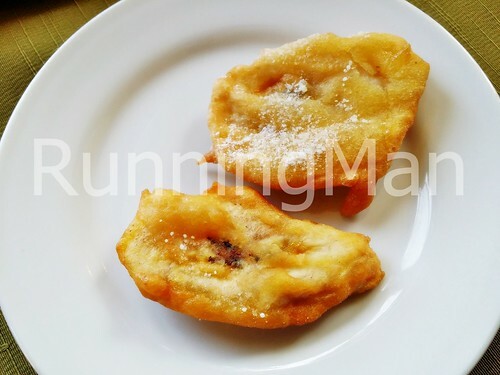 While similar to the snack found in Singapore and Malaysia, the Indonesian version usually includes a sprinkling of sugar, and then dipped in palm sugar and eaten as a sweet dessert. 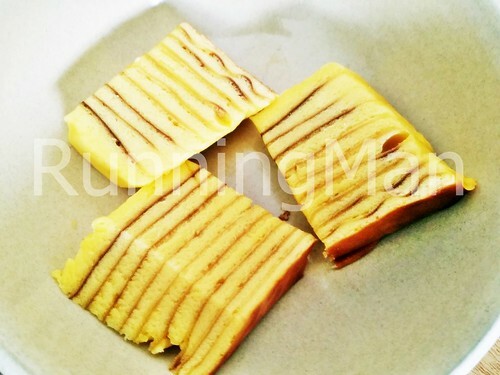 Kueh Lapis Legit / Spekkoek is also a popular cake / pastry in Denpasar, Bali. 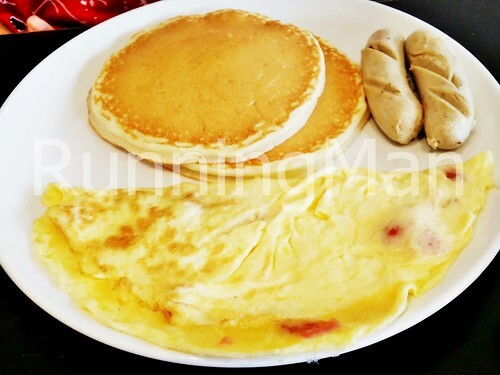 It differs from other versions across Indonesia by being slightly more airy and buttery. Spent about SGD $700 per person. 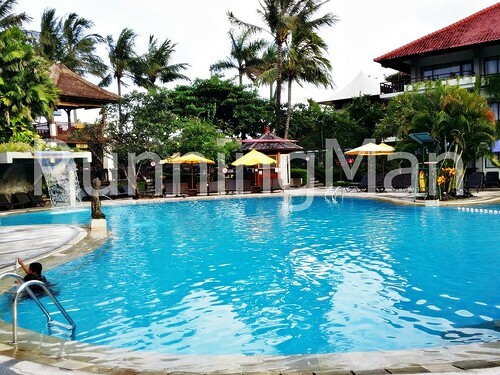 Located about 10 - 20 minutes drive from Denpasar Ngurah Rai International airport, Bali Dynasty Resort in Indonesia is a comfortable, casual family resort that is located next to Kuta Beach, within 10 minutes walking distance from Discovery Shopping Mall and Waterbom Bali, multiple international restaurants and bars offering all types of cuisine, and several fashion and beauty outlets. Dynasty Resort itself offers plenty for families to do or see, and a large proportion of its guests are from Australia. 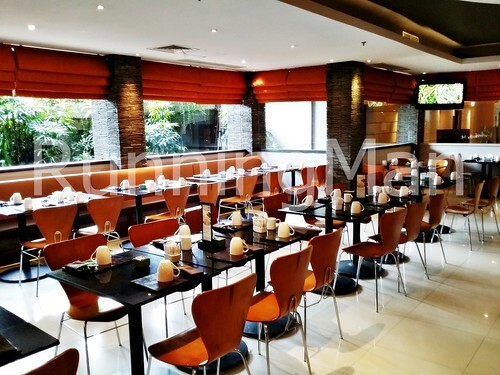 Ambience within Dynasty Resort is casual and laid-back. Staff are dressed in traditional everday Balinese clothing, and the decor incorporates traditional Balinese and Indonesian carvings, woodwork, sculptures and paintings amid lush greenery. 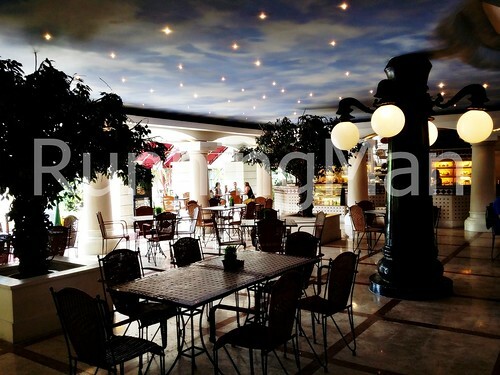 While brightly lit, the interior of the hotel is huge, and it's easy to get lost the first time you're here. The entrance to Dynasty Resort is flanked by the iconic 'Split Gates' of Bali, with intricate carvings meant to welcome guests. I stayed in the Deluxe Room at Dynasty Resort. 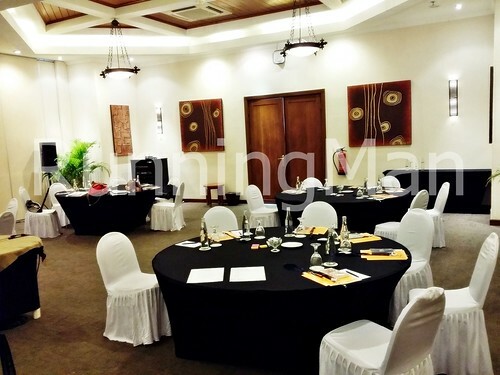 The room is medium-sized, with a small attached balcony overlooking either the pool, or lush greenery outside. 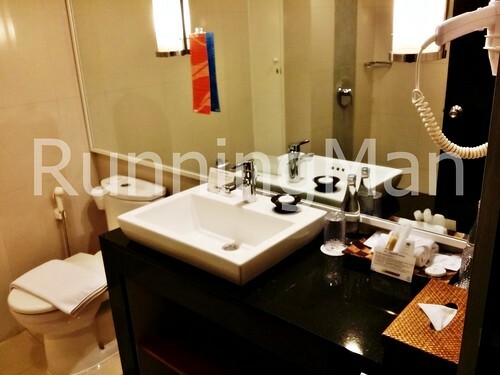 There are several amenities like toiletries, ironing board, and cutlery provided. I like that Dynasty Resort folded a cute towel elephant to welcome guests, and that the cupboards and desk are large and spacious. 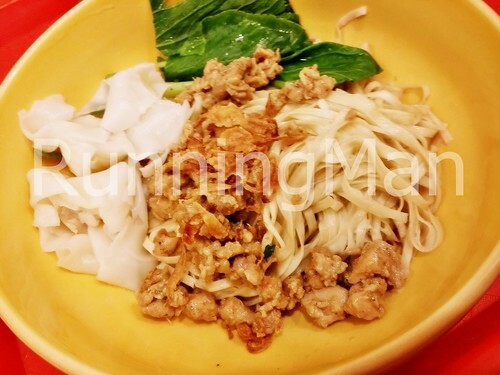 Food at Dynasty Resort is above average in general. 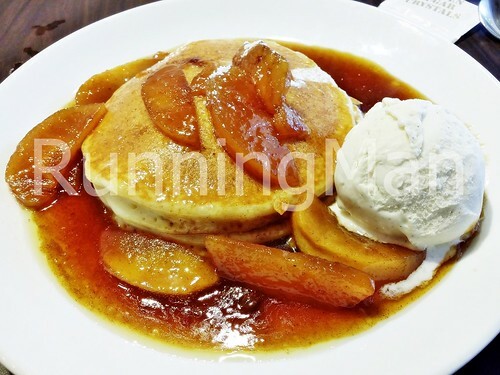 There are a variety of options to choose from, including the default buffet breakfast place SEN5ES, and Cafe Piazza, which serve both Indonesian and International cuisine. 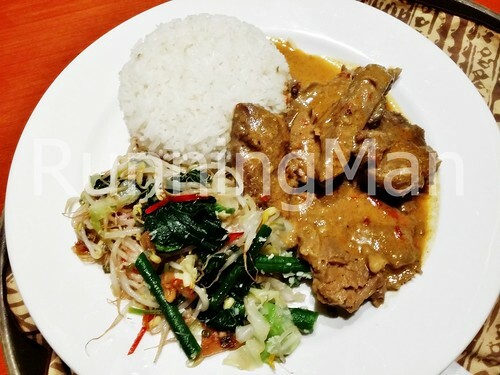 There is a distinct lack of a variety of traditional Indonesian of Balinese cuisine in the surrounding area, as most places here cater to the Western tourist demographic. Service at Dynasty Resort is welcoming and friendly. I noticed that Dynasty Resort is an equal opportunity employer, as the staff includes 'smaller' people. However, staff are rarely on standby to assist, ou normally have to call them at the reception counter, even if you're using the conference rooms. But requests do get carried out quickly, and staff also check on how your experience is going. The facilities at Dynasty Resort are well maintained and numerous, you practically never have the leave the premises because there are multiple activities everyday. 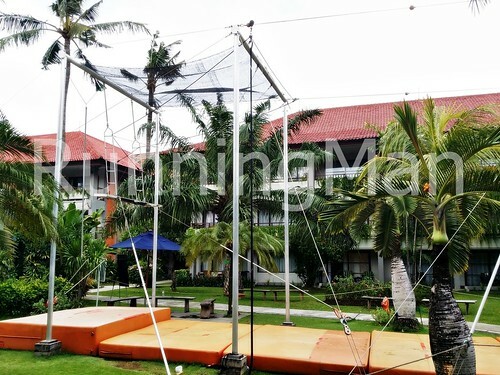 A daily schedule of events is hung in every room, and you can partake in activities as diverse as yoga to trapeze. Furthermore, the beach is just behind Dynasty Resort, and is easily accessible. Areas are allocated solely for kids, or teens. 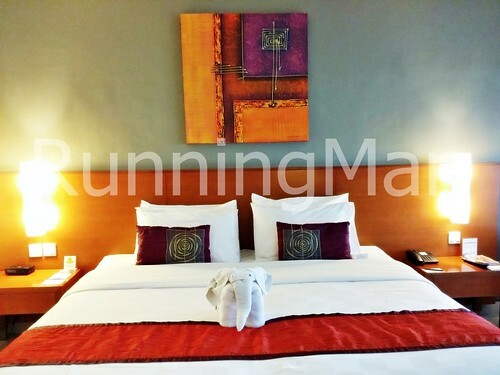 Downtown Denpasar and Kuta are also within minutes of Bali Dynasty Resort. 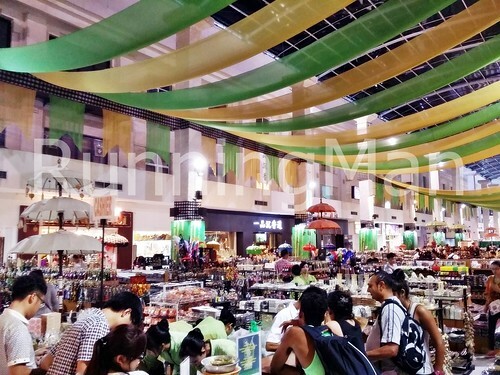 Snapshots of some of the shopping malls and markets in Denpasar.